The Review: There was no question for me who the coolest superhero was when I was a child. (Not least because I was only aware of three.) For while Superman could turn back time and Batman had a sidekick and a utility belt, Spider-Man could climb up walls and spin webs from his hands! Not only that, but in one telling cliffhanger of his TV series he fell off a building, but saved himself by spinning a web to catch himself as he fell! And he got the coolest lines of any of them. These are the kind of things that unnecessarily excite a six year old child, but we now live in a world where every superhero is restricted to an audience no younger than 12 unless they have their parents in tow. Now on our fifth Spider-Man film – the last two, as was the TV series, called Amazing – what does the latest incarnation offer us now it’s got its origin story out of the way? Nothing particularly amazing is the perhaps unsurprising answer. Marc Webb demonstrates again that his version does have an edge or two over Sam Raimi’s original, firstly in the key personnel. Andrew Garfield is a more satisfying Peter Parker / Spidey than Tobey Maguire ever was, for all the strengths of Sam Raimi’s trilogy, and his chemistry with Emma Stone’s Gwen Stacey keeps the film afloat during some of the quieter periods. Sally Field also continues to charm despite being noticeably younger than her comic-book counterpart. The web-swinging and slinging continues to be refined on a film by film basis, and the action scenes make the most of the athletic, gymnastic lead, so there’s certainly a decent amount to satisfy your Spider senses. The problems start with the villains. We have three, but none are as effective as they might be. Jamie Foxx feels miscast as the pre-transformation Electro, and his character is completely mislaid for large stretches in the middle of the film. He still fares better than Paul Giamatti, whose appearances bookend the film and you might just have worked out who he is by the end of the second of them. Dane DeHaan is an improvement over James Franco’s rather static Harry Osborn, but his relationship with Peter has a hollow, unconvincing feel to it and his transformation into the latest incarnation of a familiar villain is based on some dodgy fudging of the mythology. There’s also a certain amount of franchise sowing going on, from Felicity Jones’ extended cameo to the costumes of future bad guys in the background; the main problem is you can’t help feeling you’d have preferred those costumes to be the ones being worn this time out. While Webb marshals the action scenes clinically, he’s less successful at wrangling the script from Alex Kurtzman, Roberto Orci and Jeff Pinkner. Kurtzman and Orci recently announced they would go their separate ways as a writing duo, and on the evidence of this (and Cowboys & Aliens, two Transformers movies and their dreadful effort for Star Trek Into Darkness) it can’t come soon enough. Even three minds aren’t enough to deliver a script that rises above the generic and predictable, spending so much time on the origins of its new characters that it never surprises with the older ones. If you, like me, can’t remember much of what happened in the original of this sequence, you’ll appreciate the extensive catch-ups woven in – which in turn drag the running time out to a testing two hours and twenty – but none of that can help overcome the plodding predictability or prepare you for the slightly sickening crassness of the way in which the climactic twist is staged. When the Marvel properties at Disney are learning and developing, Sony’s Spider-Man just feels like it’s retreading the same mistakes. With two more films and spin-offs already in the early stages of production, they’re going to have to learn the lessons quickly to return Spider-Man to the place of my favourite. Why see it at the cinema: The web-work is undoubtedly the most impressive yet in the series, and although I saw it in 2D, everything suggested those elements would work well with an extra dimension if you’re so inclined. The action scenes can get a bit busy, so seeing them in a cinema will help work out who’s hitting who with what at key moments. What about the rating? Rated 12A for moderate violence and threat. The BBFC descriptions become ever more dramatic, including on this occasion the line, “Human characters transform into scary looking super-villains, with close-ups on their creepy looking eyes and skin.” Find me an eleven year old who’s creeped out by this lot. My cinema experience: A Friday late night showing at the Cineworld in Cambridge. The staff kindly – and firmly – pointed out upon my arrival around 11:20 p.m. that there was nothing at the end of the credits. Not only a generous public service but also undoubtedly a group of people who would be kept working an extra seven minutes at 1:30 a.m. by a bunch of nerds waiting for a clip that never comes. I stayed for the bizarre mid-credits X-Men advert (designed to fulfil a contractual obligation of Marc Webb’s) and then made my excuses. 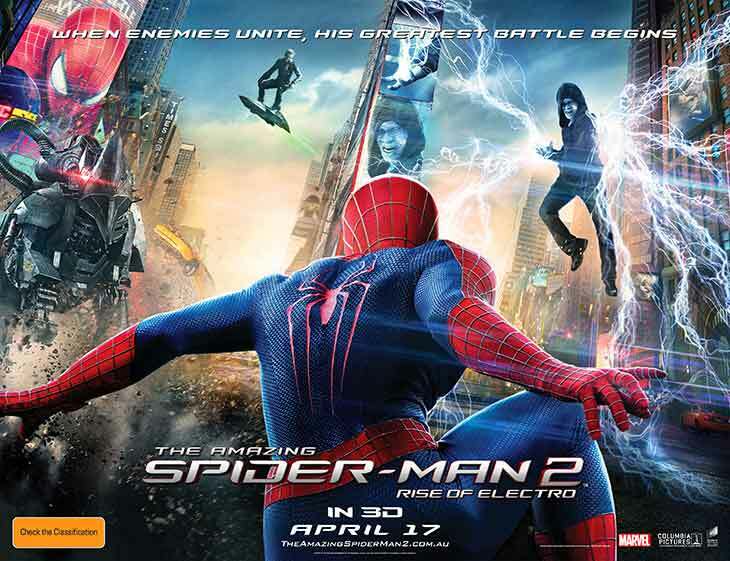 This entry was posted in Reviews and tagged 2014, Andrew Garfield, Emma Stone, film, Jamie Foxx, Marc Webb, movies, review, The Amazing Spider-Man 2. Good review. I perhaps enjoyed the film more than you did and felt the performances from Garfield, Stone and Field basically saved the movie from the studio interference and unnecessary set ups for future franchises.